In 2010 the US mining and gas company, Renco, managed to successfully avoid having to pay compensation to Peruvian locals who were harmed due to pollution by their companies by successfully using a provision of the Peru-US Trade Agreement. Not satisfied with avoiding having to pay compensation, the company has since demanded $800 million from the Peruvian government as they argue that one of the companies they own, Doe Run, was forced into bankruptcy due to an expensive pollution clean-up which the Peruvian government required Doe Run to conduct. 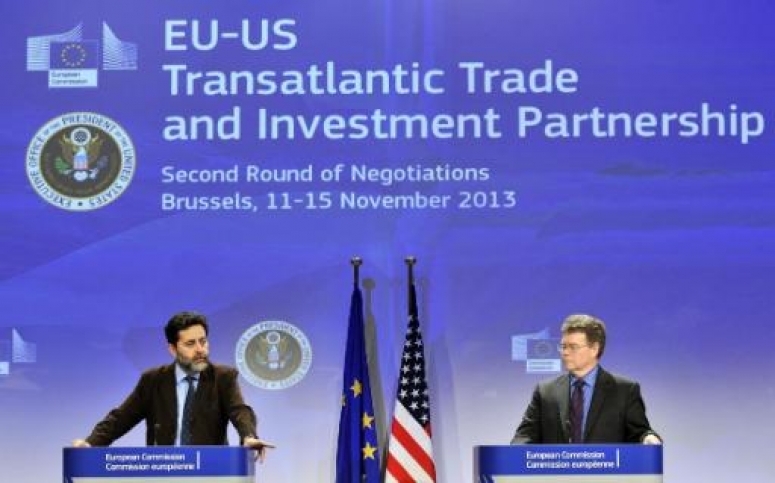 It is with this understanding that on Monday 10th March last, the fourth round of negotiations of the Transatlantic Free Trade Agreement ( TAFTA )or the Transatlantic Trade and Investment Partnership (TTIP) got under way. In a nutshell, TTIP claims to be a free trade agreement between the US and EU which will lead to an increase in employment and income in both economic areas and create the largest free trade area in the world. This agreement, if implemented, will have far-reaching and potentially very dangerous consequences and yet practically nothing has been written on the subject in the media and discussion on the matter is worryingly absent. Total disregard has thus far been shown to the citizens of both the US and the EU as this treaty is being kept secret from the populations who will be subjected to them, though not of course from the hundreds of corporate lawyers and lobbyists who are carefully writing them. The EU Commissioner for Trade, Karel de Gucht, had previously stated that he would not accept the US’s push to allow business interests a bigger role in negotiations before later stating that he was “ready to work in that direction”. Furthermore, US President Barack Obama has also further added to the erosion of the democratic process by successfully securing approval from Congress for his fast-track negotiating authority. Therefore, a highly secretive, wholly undemocratic process is being pursued with the ultimate aim that the ordinary citizens will be expected to accept this deal without question. Supporters of the treaty have argued that the negotiation and eventual implementation of this agreement will provide financial growth and jobs on both sides of the Atlantic. Responding to an article written by the journalist George Monbiot in which he criticized the TTIP, the Conservative British politician Ken Clarke stated “By best estimates, (the TTIP) will deliver a £10bn annual boost to the British economy alone, increase collective output by as much as £180bn, create thousands of jobs, and deliver lower prices and more choice to consumers.” However these figures have already been proven to be highly exaggerated and a inflated version of reality by Ferdi de Ville of Ghent University and Gabriel Siles-Brügge of the University of Manchester, in their study of the financial benefits of the TTIP ( available here: http://bit.ly/1jeIAvK) . The main beneficiaries of this agreement will undoubtedly be the businesses and corporations who will have a much broader platform where they can maximise profits at the expense of the workers and operating with practical impunity thanks to the Investor State Dispute Settlement (ISDS) provision. Of all the proposals under this treaty, the most concerning aspects of the negotiations is the inclusion of the ISDS provision. This particular inclusion is not new to the TTIP as it was first introduced to trade agreements to protect companies who wished to set up in countries where the rule of law and court system were very weak. The ISDS conferred special legal powers upon companies to sue their host countries in special offshore tribunals, governed by corporate lawyers, should their rights be infringed upon. However both the EU and US possess strong judicial systems and the inclusion of this ISDS provision has proved to be highly controversial. Under the ISDS, individual corporations will be elevated to the position of equal authority among nation states and will have the ability to bypass domestic courts in place of an international arbitrary tribunal which has the power to demand the State to compensate the corporation for a perceived loss of earnings due to the State changing public policy. This compensation will naturally be passed on to taxpayers which creates a worrying situation for citizens while simultaneously awarding overwhelming power to the private companies. For example, should a tobacco company interpret legislation, which is introduced to increase awareness of cigarettes harmful effects, as a barrier to their trading abilities then they will have a platform to take that State to this tribunal to demand compensation. This has already occurred in both Uruguay and Australia, where the largest cigarette company in the world, Phillip Morris, has taken both countries to court for introducing anti-smoking legislation as their fear of losing profits is far greater than their concern for the health Australia or Uruguay’s citizens. Unfortunately this is not a new development in bi-lateral trade agreements; Lori Wallach the director of Public Citizen’s Global Trade Watch and vocal opponent of this trade deal, is on record as stating that this is nothing short of a “corporate invasion”. Several arguments have been put forward to support the negotiation in private of the TTIP, principally that if the US were to get their hands on the approach the EU were going to take towards the negotiations, or vice versa, then this would make it a lot harder to effectively negotiate. However, in order to ensure as much transparency as possible, surely once both parties have concluded negotiations on a particular subject, it should be released into the public domain. As it stands, the public is not entitled to know anything about what is being agreed upon save to be continuously told by corporate interests of the importance of accepting the free trade agreement for the sake of jobs. What this agreement between the US and EU will lead to is a serious curtailing of the governance authority of nation states, to the benefit of corporations. A society constructed and controlled by business interests is highly destructive to the social fabric and all measures must be put in place to combat this. A resounding rejection of any agreement which hasn’t been first presented to the public is the only way to ensure that overreaching corporate dominance doesn’t become a reality.